These toys are perfect for cooling off, getting creative, and exploring. 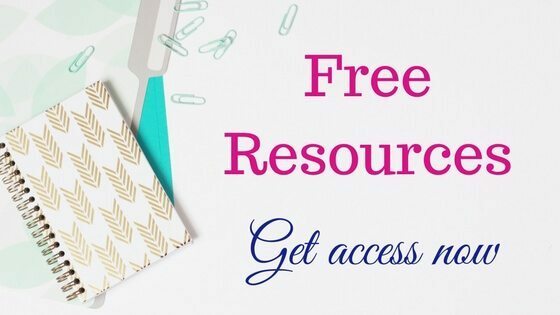 **While all opinions are my own, and we’ve used most of these products, there are affiliate links in this post. Clicking on the link and purchasing a product supports this product, and hopefully, it’s a cool outdoor toy too. 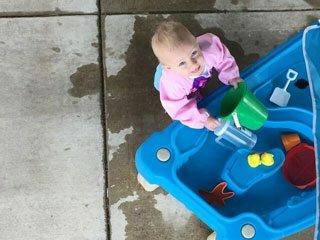 Our Step2 Cascading Cove Sand and Water Table is a hit at our home. We fill both sides with water. It provides hours of entertainment because it’s small like your toddler making it easy to stand next to the table and play. The Step 2 table has a removable umbrella which I love. I’m always worried about sun exposure on my toddler’s fair skin. The umbrella is not available with most water tables. That made the Step2 Cascading Cove Sand and Water Table stand out among the rest. It also has two sides, so you can have water and sand. It also has a cover to keep dirt, debris, and bugs out of the water and sand. Although I have to admit, we are not good about covering it up. That’s a hint to myself. It’s nice when all the toys are hooked on the play table, because it’s hard to find accessories that clip onto the play table. The drawback is that you don’t have as much area for splashing and toys that float. While we use our water and sand table only for water, this summer we’ll experiment with sand. So many parents warn against sand because it’s so messy, but it’s summer. Our daughter loves the dirt, so we need some sand. Whether you get a separate sandbox or use the water and sand table, you need sand. Before you rush to the store to buy play sand, educate yourself on the health concerns surrounding sandbox sand. While natural play sand is more expensive than the sand you buy at the store, it doesn’t come with the cancer warning. We love to go to the pool, but sometimes the pool is just too overwhelming for a toddler especially if it’s a large pool. The kids feel freer in a play pool, and it’s less stressful for parents too. Pools have come a long way since I was a child. There are so many more options than the plain, blue plastic pool. The Intex Rainbow Ring Inflatable Play Center has a slide, wading pool, water sprayer, and ring toss. It’s inflatable, so perhaps not as sturdy as a plastic pool. If you’re ready to keep it inflated all summer long, which isn’t always easy, this is a great option. 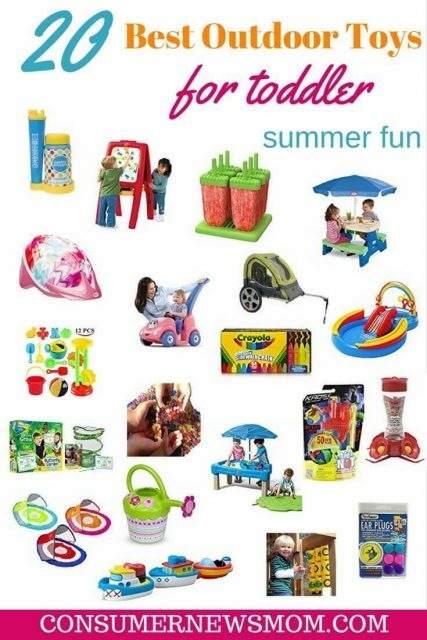 If you’re buying a water table and pool, you need accessories for your child to play with in the water. Here’s a tip: keep it simple. The simplest water toys will leave your child entertained for hours. Our daughter simply likes to pour water from one cup into another. The Dollar Store is also a great place to get cheap pool and water table toys like rubber ducks and sand pails. 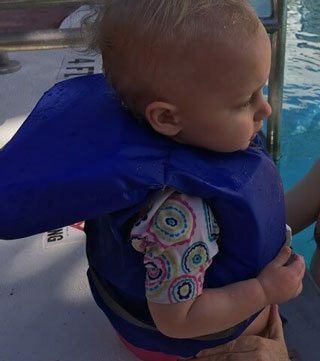 If your toddler is going in a full sized pool, you’ll need a life jacket, swim vest, baby floaties, or a raft. I like the combination raft and floatie. 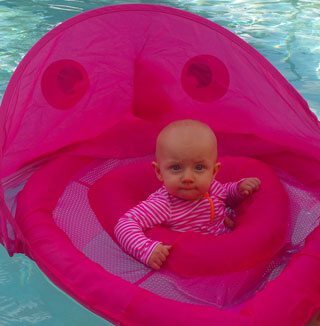 The Swimways Baby Spring Float Sun Canopy protects your child from the sun, and you can use it for several years. We started using the float when our daughter was just six months old. It’ll be perfect this summer too. The Swimways Baby Spring Float holds the child upright so they can learn to kick their legs. They are secure in the float, and it’s a great way to get your child acquainted with the water and the mechanics of swimming. It also has a decent canopy that keeps some of the sun off your child’s fair skin. Plus, it’s not constricting. So many swim vests and life jackets are bulky, making it hard for your child to move. If you are looking for a swim vest, there are several options. Swim wings like the Stearns Puddle Jumper Basic Life Jacket attach at the body and the arms. However, the arms are not adjustable. So, if your child is tiny the arm wings slide off. In my experience, most of these don’t fit until your child is 30 pounds. Stearns is a reliable life jacket brand, and you just can’t go wrong with the price. To save even more, wait until the end of the season and buy a life jacket that will fit your child the next summer. Once your child is safe around the pool, now it’s time to deal with swim diapers. Ugh! 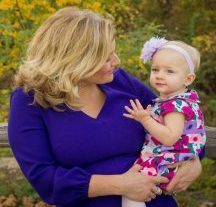 What a headache and learning experience for a new mom. I learned the hard way that swim diapers don’t perform like regular diapers. Swim diapers are expensive, and if they don’t do much, why not use cloth diapers? You don’t have to use cloth diapers for everyday use to like cloth swim diapers. Cool off all summer long with reusable ice pop molds. Just fill them with a smoothie, shake, or juice and enjoy a refreshing snack. I love the ice pop molds because they allow me to give my child a nutritious snack that’s not loaded with a bunch of ingredients I don’t recognize. I simply blend fruit, almond milk, and/or coconut water and pour the mixture into the mold. In a few hours, I have frozen ice pops. As a mom, I like products that allow me to create the food my daughter eats. Plus, if your child is teething these pops soothe their sore gums. 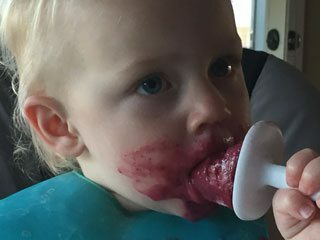 A waterproof bib is perfect for a messy eater, ice pop lover, or a child who likes to indulge his creative side. The Hi Sprout Unisex Waterproof Sleeved Bib is a waterproof bib on steroids. It has sleeves, and velcro in the back. It’s similar to an artist’s smock where the back is open. There’s even a pocket in the front. We love ours and use it for messy food, water play, and creative play like painting. Our daughter loves to chase the birds around the yard. While any bird feeder will provide hours of entertainment for your child, a hummingbird feeder is a great way to attract colorful birds without the mess of bird seed. Moms don’t need a bigger mess than their children already create. The hummingbird feeder attracts beautiful hummingbirds as the name suggests, but also other small birds. We see a variety of birds at our feeder. Butterflies are amazing creatures to watch. Their graceful wings flutter from one flower to the next. 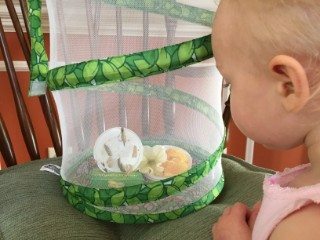 This summer, teach your children about the life cycle of butterflies. Get an Insect Lore Butterfly Kit and watch the caterpillars morph into beautiful butterflies right before your eyes. The kit comes with a butterfly voucher. You may still have to pay shipping and handling. Sidewalk chalk provides hours of entertainment. 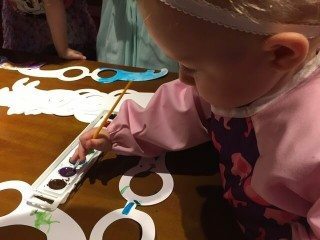 It’s a great way to teach your child to draw, write, and color. There is no way you can make a mistake. It’s all washable and provides hours of fun. 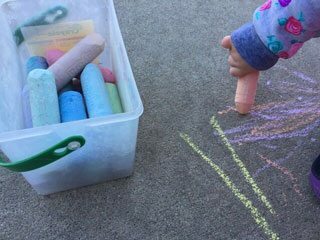 Sidewalk chalk is a little messy, but what isn’t in the summer? I always keep a bag of wipes outside, so we are ready for any outdoor messes. Kids love bubbles. You can’t have enough. While cheap dollar store bubbles will do, you can’t beat Gymboree Bubble Oodles. They simple are the best. You don’t have to worry about getting your hand sticky, there’s no wand to hold, and the bubbles linger in the air giving your child lots of time to pop them. Here’s a little trick with the Gymboree bubbles, Bubble Oodles. Pour the bubbles into the reservoir and let them sit for a few minutes. The solution will get hard and the bubbles will hang in the air longer because they are stiff. 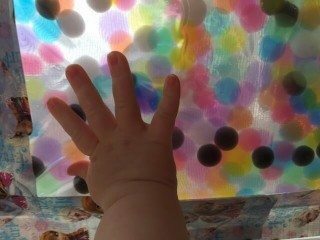 Sensory bins are our go-to activity. You can put pasta, rice, or water beads inside. Buy a bunch of plastic storage bin , and fill them up with an assortment of textures. There are so many ways you can use water beads. We’ve put them in water bottle containers to make shakers and calm down bottles. I’ve also put them in a bag and taped them to the window. Water beads are fun to play with, however, you have to be careful. If your child still puts things in his mouth, I don’t recommend water beads. They are small and slimy when wet so they are easy to swallow. They go from sensory bin to mouth before you can stop it. While not hazard, do you really want your child eating a water bead? Also, they create quite the mess rolling all over your floor. Put down a plastic tablecloth to catch any loose water beads. It’s worth every penny! If you don’t want to pay full price, look on Facebook swap shops for used bike trailers. Just make sure you buy from a reputable family, and that it comes with all the safety gear. Our daughter is not a huge fan of her car seat, a pack n play, or any other area where she’s confined. She likes to move around, so we weren’t sure about the bike trailer. However, she loves it, especially when we go fast. 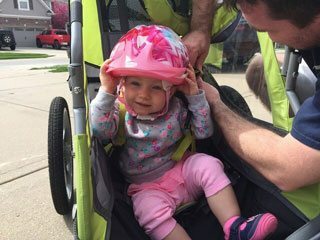 Unlike the car seat, I think she doesn’t feel confined in the bike trailer because there’s so much to see and the rush of fresh air. The trailer is easy to attach, and easy to switch from one bike to another. The trailer does not come with legs of steel! You’ll need those to pull a child. Even a toddler. Between the trailer and the child, you’re pulling a lot of extra weight. All kidding aside, it’s a great workout and as long as you’re not riding up big hills you’ll be fine pulling your child. 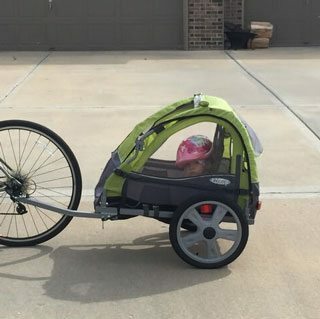 The bike trailer will bring years of enjoyment to any family. While the child will outgrow the helmet, the trailer is roomy. You can also push your toddler in the car. However, it’s not the easiest to push. It’s low to the ground so if you’re a tall person, you’ll be bending over to push your child down the street. This car is more of a play toy than a take your child for a walk car. 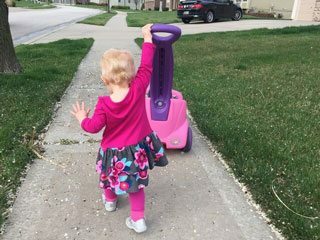 Perhaps when our daughter can push herself, it will be more fun for walks. Right now, her feet get stuck underneath her. We love our Step2 Push Around Buggy. We bought it from a neighbor, who nicknamed it Rosie. So, we lovingly call our push cart Rosie. It’s great for walks around the neighborhood. Lift the front hood and you’ll find a compartment for storing snacks, suntain lotion, sunglasses and other goodies. If your child is the independent type, it’s light enough they can push the cart. If you want to be the trendy family in your neighborhood, your child needs a Plasmart Plasma Car for boys or girls . These are awesome. Your child rolls around on the low to the ground car. There are no pedals, gears, or batteries. The car moves when the child turns the steering wheel. Nothing says summer like a water balloon maker. My favorite childhood activity is now easier than ever to create. No more busted water ballons. The Tie-Not Water Balloon Filling Set allows you to fill balloons quick and easily. Tie-Not is the original brand which appeared on Shark Tank. There are many similar products on the market that also make it easy to fill water balloons. 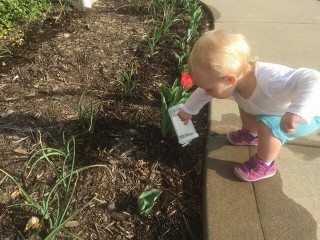 Toddler’s love to imitate their parents, and if you have lots of flowers expect your little one to be eager to help.Our daughter loves to water the flowers with me. It’s a great way to teach kids about how plants grow. You can buy a watering can or an outdoor garden kit for your toddler. We need to upgrade our watering can. A Dollar store container works well too, as you can see in the photo. Painting is lots of fun for toddlers, but not the adult left cleaning up the mess. That’s why you need the Hi Sprout waterproof bib or smock as I call it before you start. Summer is a great time to try creative and messy projects. It’s easier to clean up a mess outside than inside. The easel is great for outside and indoor play fun. Here’s a trick. If you’re worried about paint staining your concrete, put a plastic tablecloth under the easel to catch the splatter. Do you have a favorite outdoor toy? Share it with our community of moms and dads. Thanks. Which is your favorite?